After tomatoes, growing green beans seems to be the most popular activity in the community gardens that I visit around Denver. There are green ones, purple ones, yellow ones, striped ones, and… oh yeah, green ones. Growing green beans of one kind or another is popular in most cultures around the world. There are thousands of varieties, with at least a few to match almost every climate (okay...so not the North or South Pole!). But because of their relatively high protein content (for a plant food, that is) and their ability to be dried and stored for long periods, they are one of the staple foods of humankind. So there is no reason to ever get bored – you can spend a lifetime growing green beans and never grow the same variety two years in a row. In this article, I’m going to focus on growing “snap beans”, or the regular type of green beans that most people grow to eat fresh, rather than dried. These come in two basic growth forms, bush and pole. Bush Beans grow about a foot to 18” tall and bear a big crop of beans in a relatively short period of time, with a few stragglers coming along later in the season. 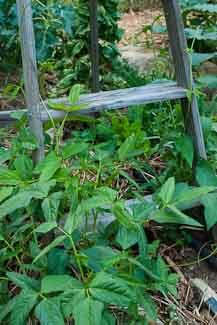 For a more sustained harvest, plant bush beans multiple times throughout the summer. 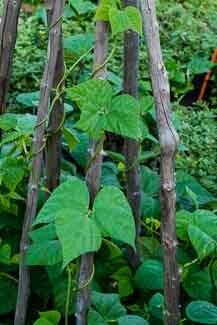 Pole Beans grow anywhere from 3 to 6 feet tall, depending on variety. They are a vine, and need to be able to wrap themselves around something in order to grow upward and not outward. They keep producing as they grow, providing a more sustained harvest. 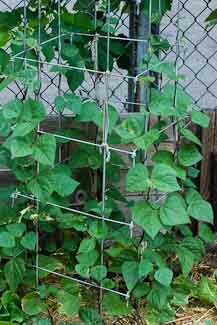 Growing pole beans is an entry point for a whole world of vertical vegetable gardening. 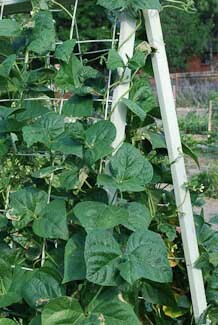 If you have limited space, try growing vegetables (winter squash, melons, cucumbers, tomatoes, gourds, pumpkins) vertically on a creative variety of trellises. Plant green beans about 1” deep. 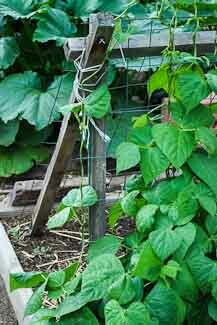 If you're growing bush beans, space them about 3-6” apart, and space pole beans about 10” apart. Most of my garden is in French intensive raised beds, so I plant mine in a hexagonal matrix pattern on “centers” rather than in parallel rows. If you plant in rows, just follow the recommendations on your seed packet. Beans like warm to hot weather and enough water to keep growing and producing juicy, "snappy" beans, but not so much water as to be soggy. Direct seed your garden after the soil has warmed up to at least 60 degrees F., and you’re sure the possibility of frost is over. Even a night in the mid-30s will shock and wilt green beans. You will sometimes read on seed packets to plant a “hill” of beans, squash, or cucumbers. This doesn’t mean a literal hill, it means growing green beans around in a circle, usually with some sort of trellis in the center. Don’t know why the misnomer exists, but it persists and is misleading. The phrase “a hill of beans” has caused many a beginning gardener to get into trouble. In Colorado this year, we are in a terrible drought, and yet I have seen many people in the community gardens growing beans on elevated mounds, which are always dry and have nearly baked the poor plants to death. Most have yielded no beans at all. It makes much more sense in hot, dry climates to grow beans as the ancestral native Americans did in the southwest: in a trough with hills channeling water down, so that any sparse rainfall from passing thunderstorms gets directed to the plant roots. The only circumstance where I would recommend growing beans on a raised mound or hill is if you do happen to live in a place that gets tons of rainfall, or if your garden is in a “soggy bottom”. But most people should grow beans on level ground with plenty of compost dug in when you prep your soil in the spring. And chances are you don’t need to fertilize beans – unless you have done a soil test that shows exactly what your soil is deficient in (if anything). This is because beans belong to the wonderful legume family. Legumes have a unique symbiotic relationship with a bacteria in the soil called Azotobacter, which has the ability to take nitrogen from the air and convert it into a form that plants can use directly. If your soil is nitrogen deficient, it is best to "inoculate" it with Azotobacter, which believe it or not, is pretty commonly available at better garden centers or seed catalogs. The native Americans may not have known about “Azotobacter”, but they knew that if they planted beans and corn in the same hole, the corn would be greener and more productive, and the beans would have something tall to climb up. They also planted squash around the base, which shaded the soil and helped keep it from drying out. Some say it also kept raccoons and other critters from getting to the corn. My racoons are smarter than that, I'm afraid (and they also like pumpkins!). This classic combination was called “The Three Sisters”, and is a wonderful example of companion planting. Growing beans and corn together works just as well today as it did 5,000 years ago – the nitrogen-fixing nodules (filled with Azotobacter) on the roots of the beans feeds the corn the nitrogen that it is always hungry for. The story of native Americans putting a fish in the hole along with the corn also attests to corn’s nitrogen appetite, but from what I have researched, it’s more of a story than a reliable fact. The most common pest that can decimate green beans is the Mexican bean beetle. It looks a bit like a ladybug, but is more yellow- to-reddish-brown. It has a row of spots across the middle of its body, rather than a scattered pattern. Sometimes they chew your leaves at night, and beginning gardeners can go crazy trying to figure out what’s chomping up their beans. You can prevent Mexican bean beetles from getting to bush bean plants in the first place by using Reemay or other floating row covers, but this can be challenging if you’re growing green beans up a trellis. Neem oil works against Mexican bean beetles, but it is not an instant overnight fix. Neem works by deranging bugs and stopping their feeding and reproductive cycles, rather than by killing them outright. There are many other bugs and diseases that can affect your growing green beans. The enemy horde also includes aphids and spider mites. Aphids are fairly easy to control with either homemade or commercial insecticidal soap spray. 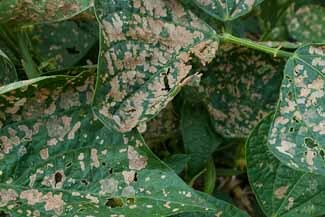 But spider mites... if you’ve got them, I’d honestly recommend euthanizing your whole green bean crop and destroying the plant residue (get it off the property). I’ve tried lots of things against spider mites, but because of the length of time the eggs can remain viable, they have always come back with a vengeance. The main thing in harvesting green beans is to check often for them. Growing green beans can develop quickly, and if you let them hang on the vine too long, they will quickly become too tough to eat. Like flowers, zucchinis and many other things, the more often you harvest them the more they will produce. The plant is just trying to make seeds, and every time to stop that by harvesting, the plant just keeps going back to square one to try to make seeds. When I am growing green beans up sunflower or corn stalks, I often miss a few among all the foliage, and at the end of the season when I’m doing fall cleanup I’m always pleasantly surprised to find dried beans hanging among the plants I pull out. I harvest the ones I missed to use as seed beans the following year. It seems so unfair that the glorious bean has been historically equated with poverty or low value. Phrases like “It doesn’t amount to a hill of beans”, “I’ve been living on beans lately”, or “I’d sell it, but it’s not worth beans anymore” must have come into existence because beans are so inexpensive and widely available. But to me, that attests to their great worth! Like many other common things we take for granted, the “lowly bean” goes largely unappreciated. IMHO, beans are such a gift to humanity. I appreciate their contribution to ending global hunger, their high protein content and healthful fiber, their willingness to grow just about anywhere, and most of all, their deliciousness! I think we should celebrate with a Bean Appreciation Day… what do you think? Create Your Own Page Here! Do you have a raised bed or trellis idea to share? Bragging rights to a monster pumpkin, or a mistake you made that you can only laugh about in hindsight? Share it here by creating your own personal page on this site, which your family, friends and others can see and comment on. Jump on in and get your hands dirty. We know your thumbs are green! Your stories and ideas will appear on your page exactly as they are entered here. TIP: Most people scan web pages, so include your best thoughts right up front, and try to keep it focused. You can add up to four photos below. If you want to upload more images (up to 4 total), click on the link and repeat.